Bull Pull Kennels was established in Baltimore, Maryland and is now located nationwide in the following states: Maryland, Indiana, New Jersey, Virginia, Connecticut, Pennsylvania, North & South Carolina, Michigan, Texas and California. The kennel’s primary contacts are Shawn and Kati Coles in Maryland. 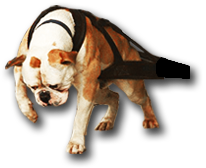 Bull Pull Kennels is a collaboration of multiple familys and individuals that share a passion and love for the American Bulldog. All parties have agreed to live by the highest ethical standards, both in and out of the world of the dogs. This includes but is not limited to health checks, proper immunizations and keeping the dogs in a loving family environment. While helping to improve this amazing animal, every person or family involved maintains full time employment elsewhere with the understanding that dog sales are not a form of income. Please be aware – we are a multi-family kennel that shares the love of the American Bulldog. That being the case, many of our dogs are placed in friends or family’s homes in order to provide the highest level of care possible to each dog in our program. If you are interested in a particular dog, please contact us for the location of that particular dog. However, we are constantly attending dog shows all over the country! Feel free to contact us to find out what dogs will be shown near you. We have developed a program to produce all around sound American Bulldogs. They are show quality dogs for working with a “drivey” temperament while even tempered to be great family pets, fantastic companions for families and children. Our dogs are consistent in type and health. We do not stretch any photos nor exaggerate weights or measurements. We feel everyone should be honest with these things especially with the importance of trying to match up great American Bulldogs for breeding. Not everyone is looking for the biggest dog, heaviest dog, biggest head size, etc. All of our information is exact.